Every 'diet' has its villain or group of foods that you are not allowed to eat. 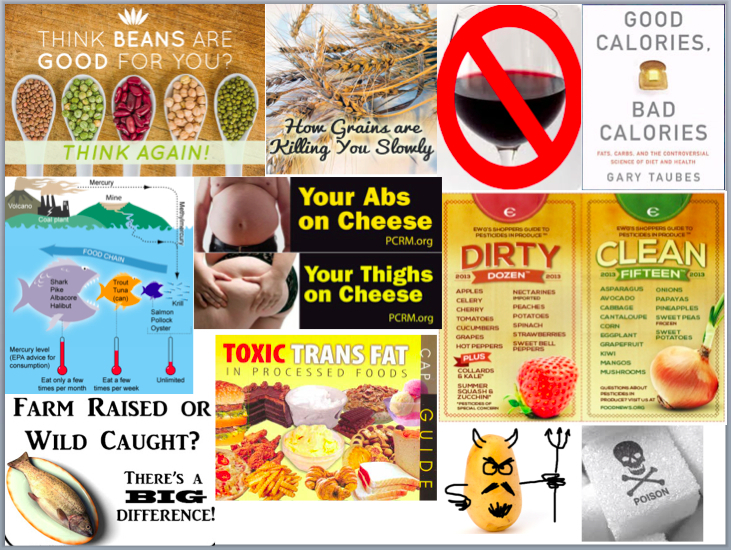 Apparently beans, grains, red wine, fish, cheese, conventional fruits and vegetables, trans fat, potatoes, sugar (especially sugar-sweetened beverages) are all things that should be off-limits. I do not agree! Can you eat low (or no)-carbohydrate the rest of your life? Can you eat meal replacements or TV dinners the rest of your life? “Dieting” is defined by the “foods you cannot eat”, and is a word I wish we did not use. Your diet should simply be defined as “the foods you do eat”, period. When the sole focus of your diet is on restriction, eventually you will slide back into your old dietary habits. No matter how hard we try or how much we fight it, dieting is unsustainable. I would rather talk about the foods that you CAN eat in your diet. Most diets will promise you that on their diet you will 1) lose weight, 2) become healthier, and 3) have more energy. The only thing you have to do is completely change the way you eat and cut out the majority of foods you habitually consume. What if I told you there was a different approach where you could 1) lose weight, 2) become healthier, and 3) have more energy without drastically changing the foods you eat. Would you take it? Well, this is what I would like to offer you! Our dietary habits are established at a very young age (during childhood and adolescence) and are fully engrained into us by adulthood. Along the way we also develop preferences for certain foods, when and where we grocery shop, what types of restaurants we like to frequent, what types of snacks we consume, the number of snacks and meals we consume a day, and so on; the list is really endless. These dietary habits are extremely difficult to break as they have been established over the course of years and decades; not to mention the emotional ties we have developed with these foods over that timeframe. I feel that, historically, health professionals have missed the boat in trying to nudge society into eating better. As recently as 2006, the American Heart Association (AHA) advocated for individuals to eat a low-fat, balanced diet (1), which based on the United States Department of Agriculture Guidelines (USDA) food guidelines consists of eating a low-fat diet of approximately 2 cups fruit, 3 cups veggies, 8 ounce equivalents grain, 6 ounce equivalents protein, 3 cups of dairy, and a maximum of 6 teaspoons of fats per day for an adult. The problem with the USDA diet is that no one eats like this! Even the most ardent observers of the food guide pyramid oftentimes do not meet the USDA recommendations for nutritional intake. In theory, the low-fat diet is the best possible diet that you can eat for health and wellness, however, to demonstrate how difficult strictly following the USDA low-fat diet is, scientists have shown that some of the recommendations are mathematically impossible to meet simultaneously (2). In 2009, the American Dietetic Association (ADA) and the American College of Sports Medicine (ACSM) began to recognize that high-protein, low carbohydrate diets may promote weight loss in the short term (less than 1 year) as effectively as a low-fat diet (3). The most recent recommendations from the AHA and the American College of Cardiology (ACC) in 2013 now recognize the merits of both the low-fat and the low carbohydrate diets in initiating weight loss so long as an energy deficit is present (4). The key point here is the focus on an energy deficit, regardless of the diet type and not the macronutrient content of the diet. We spend far too much time searching for the magic diet or macronutrient combination that we think will allow us to lose weight. Unfortunately, we will never find this perfect macronutrient content because it does not exist (5). Scientific studies have also shown that regardless of the diet type (low-fat, Atkins, Zone) that dietary adherence is the strongest predictor of weight loss (5, 6). The problem here is that dietary adherence significantly wanes after six months and really takes a nose-dive after one year. It is relatively easy to adopt new eating patterns but extremely difficult to maintain those new eating patterns in the long term. Prototypical Healthy Diet: the best possible diet you can consume consists of fruits, vegetables, fish, and boneless, skinless, chicken breasts but is very very difficult to maintain. Sustainable Healthy Diet: healthy diet that contains fruits and vegetables while also allowing the flexibility to consume alcohol, burgers, and potato chips in moderation. Instead of a nutritionist utilizing a "one-size fits all" approach and saying to their client “hey, I’m going to give you a diet that primarily contains foods that you never eat and don’t even really like, but I promise you will lose weight,” why can’t we do something different? Why don’t we figure out what foods you currently eat, find out what your taste preferences are, and mold a personalized diet around the foods that you already consume out of habit. Now, I’m not saying you can eat cheesecake and pizza everyday, well you could, but you would be really hungry if you were to stay in energy balance or negative energy balance (the latter of which is required for weight loss). Rather, let’s make a list of the “healthy” foods that you already eat and build upon it. Instead of just suggesting you eat more fruits and vegetables, why don’t we find out exactly which fruits and vegetables you actually like to eat and base your diet around those. No more hearing that blueberries and turnips are “super foods” that you have to eat even when you cannot stand either of them. In my plan, the healthy foods you already eat will form the base from which you will build the rest of your diet. You’re not technically on a diet (you’re not using the bad word of dieting) but you are eating smarter! Together, we can remove any doubts about the foods you are going to eat for the week because at the start of the week, you’ll already know. Let’s take some of the decision making out of deciding when and where to shop, what foods to buy, what foods to prepare, when to prepare your food, how much to eat, and so on and so forth. You have enough to think about throughout your day. If we simplify your diet and plan out the foods you eat ahead of time, pretty soon eating healthy becomes as routine as brushing your teeth and you no longer have to remain constantly vigilant as to what foods you are going to eat. You will also be empowered by learning how to make smart, yet enjoyable, eating decisons even when outside of your normal daily routine (e.g., at a party, on vacation, eating out). We already know traditional dieting does not work (5, 6). Together, we can build a roadmap that you can easily follow to eat healthier. Lichtenstein AH, Appel LJ, Brands M, et al. Diet and lifestyle recommendations revision 2006: a scientific statement from the American Heart Association Nutrition Committee. Circulation. Jul 4 2006;114(1):82-96. Maillot M, Monsivais P, Drewnowski A. Food pattern modeling shows that the 2010 Dietary Guidelines for sodium and potassium cannot be met simultaneously. Nutr Res. Mar 2013;33(3):188-194. Seagle HM, Strain GW, Makris A, Reeves RS. Position of the American Dietetic Association: weight management. J Am Diet Assoc. Feb 2009;109(2):330-346. Stone NJ, Robinson J, Lichtenstein AH, et al. 2013 ACC/AHA Guideline on the Treatment of Blood Cholesterol to Reduce Atherosclerotic Cardiovascular Risk in Adults: A Report of the American College of Cardiology/American Heart Association Task Force on Practice Guidelines. J Am Coll Cardiol. Nov 7 2013. McCall AL. Is there a magic diet? Studying the balance of macronutrients needed for best weight loss. Current diabetes reports. Jun 2010;10(3):165-169. Dansinger ML, Gleason JA, Griffith JL, Selker HP, Schaefer EJ. Comparison of the Atkins, Ornish, Weight Watchers, and Zone diets for weight loss and heart disease risk reduction: a randomized trial. JAMA. Jan 5 2005;293(1):43-53.